This helmet is foldable and lightweight, very convenient to carry, great for cycling, commuting, skateboarding, traveling, etc. 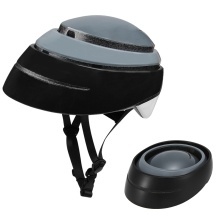 Strong polycarbonate shell and shock-absorbing EPS foam for good protection. 4 air channels improve breathability and keep you cool. Adjustable straps for comfortable fit. Easily opens and folds instantly, lightweight and convenient to carry. Perfect for cycling, commuting, skateboarding, traveling, etc.